C-STEM (Computing, Science, Technology, Engineering, and Mathematics) is a UC Approved Educational Preparation Program for Undergraduate Admission for both K-12 and Community College students to all UC campuses. Participation in the C-STEM program, C-STEM student individual and team awards, and extracurricular activities are recognized in the UC admissions process as achievements that have explicitly prepared students for college and career. New undergraduate applicants in UC on-line application can select C-STEM as a UC Approved Educational Preparation Program. C-STEM has UC A-G Program Status. High schools can readily and easily add the “A-G approved” rigorous C-STEM curriculum integrated with computing and robotics to their own school’s A-G course lists to satisfy the UC/CSU admission requirements, without submitting a complete course content description and going through the traditional approval process with the University of California Office of President. C-STEM develops computing technology, curriculum, and pedagogical strategies, and provides professional development and support for STEM teachers, even those without any prior coding and robotics experience, to integrate hands-on computing and robotics into their classroom teaching. The rigorous C-STEM Math-ICT Curriculum provides K-12 students with up to 13 years of integrated learning of math and computer science. Close the achievement gap by broadening participation of students traditionally underrepresented in computing and STEM related careers and post-secondary study. Develop students’ 21st century problem-solving skills to tackle real world concerns through integrated computing and STEM education. Our vision is to provide formal computing education for all K-12 students through existing math courses. The C-STEM Math-ICT Curriculum will provide K-12 students with 13 years of hands-on math education with computing and robotics. The C-STEM Center studies how to use innovative computing and robotics technologies to increase student interest and help them learn STEM subjects with an emphasis on Algebra, a gatekeeper for high-school graduation and careers in STEM fields. The C-STEM program helps close the math achievement gap, engages traditionally unrepresented groups and at risk students in hands-on learning math with computing and robotics. Through cutting edge research with funding from the National Science Foundation and California Department of Education, the C-STEM Center, in collaboration with our industry partners, has developed innovative educational technology Linkbot, C-STEM Studio with computing in C/C++ for K-14 hands-on learning math and computer science. By working with K-14 educators, the C-STEM Center integrates computer programming and robotics into teaching STEM subjects by creating project-based computing and robotics activities, integrated curriculum, and hands-on personalized and collaborative learning strategies aligned with Common Core State Standards (CCSS) and Career and Technical Education (CTE) Standards. This integration helps students make meaningful connections between regular STEM topics and their relevance to real-life applications as well as help develop students’ critical thinking and problem-solving skills. The mission of the C-STEM Center is to improve computing, science, technology, engineering, and mathematics (C-STEM) education in both formal and informal K-14 programs through integrated learning. The goal of the C-STEM Center is to broaden participation of students, especially female and underrepresented minorities, in computing and to develop students’ computer-aided problem-solving skills to tackle real-world STEM problems through integrated computing and STEM education. The C-STEM Center also studies how to streamline the curriculum on computing education in the context of STEM subjects in elementary schools, middle schools, and high schools, as well as the first two years of college to increase student interest in pursuing computing and STEM related careers and post-secondary study. 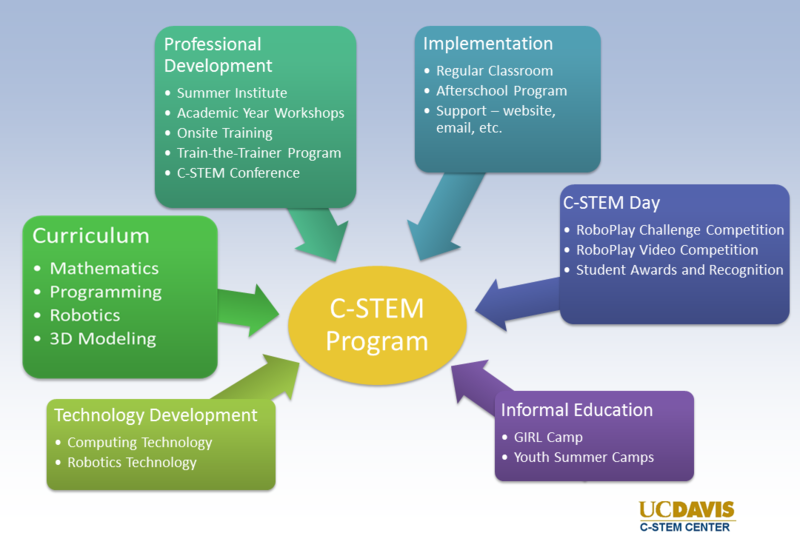 For successful implementation of the C-STEM curriculum integrated with computing and robotics in classrooms and afterschool programs, the C-STEM Center provides unique professional development for K-14 teachers without any prior computing experience to integrate computing and robotics into their classroom teaching. The C-STEM Day with RoboPlay Competition near the end of May each year is a culminating event for the C-STEM program. The C-STEM Day is organized to build public awareness and advocate for Integrated Computing and STEM education. The C-STEM Center and our partners organize annual curriculum-based level-playing RoboPlay Competitions in various regions on C-STEM Day to further engage students in project-based team activities and to showcase their accomplishments and creativity in not only math and engineering, but also in writing, art, music, and film production. The level playing field RoboPlay Competition promotes social and emotional learning. The one-week C-STEM Girls in Robotics Leadership (GIRL) and GIRL+ Camps in summer freely available in different regions are designed for girls in middle and high schools to learn computing and STEM subject through near-peer mentoring with fun and exciting robotics and physical computing activities. The camps provide life-changing experience and inspiration to campers, encouraging them to pursue computing and STEM related careers and post-secondary studies. The girls also learn leadership and communication skills and meet inspiring women leaders working with science and technology to gain exposure to the variety of opportunities available to them.